Being an owner and the operator of a vehicle, there are unexpected roadside scenarios to be prepared for. Overheated engines, flat tires, vehicle lockouts, getting stuck in a ditch, etc. are some of the issues drivers may encounter.When situations like these happen, it is best to be prepared and ready with the right resources, tools, and knowledge to handle the matters. Engines can overheat due to several reasons. One common reason is due to lack of coolant. In order to have a proper cooling operation in the vehicle, there is a need to have proper water to coolant ratio. 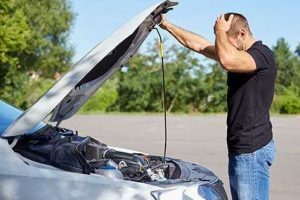 You may want to refer to the owner’s manual of the vehicle to read about the proper coolant concentration suggested for your model and make of the vehicle. Keep a bottle of radiator fluid in the trunk ready for use, should there be an overheated engine. Remember to cool the engine down completely before opening the car hood. One of the common issues drivers need to deal with on the road is a flat tire. A run-flat tire is a good choice for vehicles traveling in regions where tires tend to go flat easily. It can shield the rim of the wheel and you can drive the vehicle to a shop for repair. When you do not have this type of tire at hand, you may want to prepare a handy kit to replace or patch the tire. The kit can come in with jack and spare tire for setup, or a tire plug kit for patching a hole in the tire. Getting yourself accidentally locked outside the vehicle is frustrating, and with the engine still running, it will waste the fuel over nothing. The best way to solve this problem is to call the car lockout service. If you are interested to solve the issue yourself, you may consider using a long string, or slip knot to manually unlock the door. However, it can prove difficult to many, and could even damage the lock system if done improperly. Running out of gas is another common scenario that drivers experience. While it may seem to be a good idea to have spare tire kept in the trunk of a vehicle, it is not the same for a jug or container of gasoline in the vehicle. The flammable liquids may cause a fire if not properly stored. However, you can prepare an empty container, so that you can fill it up at the nearest gas station. Another solution is to call for gas delivery from roadside assistance companies if they offer such a service. If you happen to drive into a ditch accidentally, you have several options to solve the issue. When there is no immediate help available, you may consider using the jack to jack up the vehicle and add gravel, sand, wood boards, or any material which can help you work as a surface to move the vehicle out. However, it can be very laborious, and difficult to perform alone. The best way is to seek assistance from highway police or towing companies to get your vehicle out from the ditch safely.